It may be a bit cliche to start off the new year with healthy recipes but its cliche for a reason! We all over indulge during the holidays and start the new year with the best of intentions. The best thing about these two recipes is that they are healthy and delicious but also appropriate year round. No matter the season everyone is always looking for quick breakfast ideas what will keep them full until lunch. Here I have for you an easy green juice and a delish smoothie. Green juices are an awesome way to start your day – it seriously makes you feel virtuous all day long. They look terrible but I swear once you get past the first sip and your skepticism they are actually really yummy. Problem is you need a juicer for this – if that isn’t in your budget or you don’t think you will use it much, move on to the smoothie. I have to admit that juicers take up a lot of real estate and can be quite pricey. I don’t love mine but I also don’t use it a ton so didn’t want to spend a lot either. I have this one from Hamilton Beach and it works pretty well but if you want the best of the best I suggest you check out Sweet Home, a great site that thoroughly reviews products. They provide a range of options depending on your budget and have never steered me wrong. For the smoothie all you need is a blender. I use my Cusinart Smart Stick immersion blender that even comes with its own smoothie cup. I have had it for years and its great for smoothies or pureeing soups etc. I use a frozen banana so it almost drinks like a milkshake. Whenever one of our bananas becomes too ripe to eat I just break one up into chunks, put them in a baggie and throw them in the freezer. Each of these drinks only take minutes to make and really constitute a meal. Throw them in a cute cup and you are ready to tackle the work day. Happy New Years! Inspiration: clean out your veggie drawer and your insides! Juice all of the veggies and fruit into a container. If you would like, strain through a fine wire strainer, then enjoy over ice. The holiday season is officially upon us. I had my entire house decorated Friday by about noon but I am nuts. I was at the White House yesterday and the army of volunteers are still putting up their decorations (check out my insta for a pic!) so if you haven’t gotten around to it, don’t feel bad. For this crazy season I thought I would post things that are perfect for making ahead, ideas for simple but elegant entertaining and of course cocktails to get you through. This bagel bar is a great combo of all three and daytime entertaining is ideal for the holidays. Question: who doesn’t love a #sundayfunday brunch? Answer: the person who has to wake up early to cook! I love hosting people for breakfast and brunch as seen here and here but sometimes it can be a real “scramble” getting everything ready in the morning. Have a bagel bar means just a bunch of arranging and yes I guess some cooking making bacon but come on, we cannot skip the bacon! Everything else can be prepped a head of time so all you need to do it pop the bubbles and enjoy the day. Step one: Night before order the bagels – these beauties are the thing holding up the whole party so you don’t want subpar bagels and you certainly don’t want to show up at the bagel place to discover that they are out of the best flavors. I like to order from Bullfrog Bagels on H Street here in DC. If your bagel place doesn’t have online ordering just pick up the phone and place the order directly with them. I would budget a bagel per person even though I find that most of my friends only really eat a half once they load up on the other goodies and toppings. However, no one ever wants to be skimpy and any leftovers can be frozen. Get a mix of plain, everything and sesame (the most popular flavors) and then grab whatever looks good – I love salt bagels in case anyone is inviting me to their bagel bar! Now that the bagels are pre-ordered that means just popping out to grab them first thing in the AM or getting a helpful friend or spouse to do it for you. If you want to save even more time go ahead and order cream cheeses with the bagels, if not stay tuned for how to spruce up plain old spreads. Step two: Night before bake some sweets – brunches are built on the two pillars of salty and sweet. The bagels and their toppings have you set for savory so you need to provide some sort of dessert/sweet option. If you order your bagels from a true bakery go ahead and grab some sweets there but I like to at least have my hands in something for this party. This last time around I made Ina’s Ultimate Ginger Cookies but my cookies Banana Oatmeal Chocolate Chip Cookies would be perfect for brunch instead. Step three: Night before prep the fixings – here you can really be creative. What do you like on a bagel? What would look pretty and colorful? What is in season? What is in my fridge that I want to get rid of? Valid questions all. For this bagel bar I went pretty traditional – I had lox, radishes, red onions and horror of all horrors, cucumbers. One of the few things in the world I DO NOT EAT but here is where being a good hostess kicks in. Its my understanding that some people actually like these thing and actually the green was a nice addition to the plate so what the hell. Slice everything thinly and store in plastic bags in the fridge. If tomatoes are in season they are also a nice addition as well as thinly sliced fennel. For cream cheese I wanted to have a nice selection so I had plain as well as three flavors. Flavoring cream cheese is incredibly easy – just blend finely chopped herbs or veggies in with the cream cheese. The key is to have room temp cheese so that everything blends well. I find that the paddle attachment in a stand mixer is the best way to do this but good old elbow grease and a spatula will work as well. Just add in fixings until you get the flavor you like. For this party I did scallion, honey and walnut and a veggie cheese made with carrots and celery. Fill small bowls or ramekins with your custom or store bought cream cheeses and cover with saran wrap so they are ready to go. Step four: Morning of make bacon and coffee – ok so yes you do have to do some work here but its truly minimal. Patrick makes the coffee in our family so that’s one less thing I have to do but get it set up the night before and all you have to do is push a button. The bacon you should do in the oven as I taught you here so you can do a huge batch at once. Put as much as you can on baking sheets at 400 degrees for 15 minutes then drain on paper towels and done. Step five: Morning of set up bar – dual meaning here. You want to set up the bagel bar and the booze bar morning of. Slice those bagels and arrange them prettily in a basket or on a tray. Do not make your guests navigate the hazzards of slicing their own bagels – your friends will thank you. Pull out the prepped fixings from the fridge and set them out as well to come to room temp (except the lox which should be set out right before). Grab your toaster and set that out as well so people can toast if they want to (do you have toast tongs? If not this is a great excuse to get some). Also set up the bar so your guests can grab their own drinks. I put out sparkling water as well as sparking wine (my house cava of course), some red and white wine, sodas and a variety of juices. Glasses and an ice bucket and you are all set. This bagel bar is the perfect brunch for after a family event like a graduation or recital as you only need a few minutes of prep before your guests arrive and everything is served room temperature. Pretty presentation and thoughtful homemade touches will make your guests feel special while you can catch some extra zzz before the party. Because why not right? I always have the hardest time deciding what I want to top my pancakes with so I thought my not have ALL the toppings?? This bar works really well with smaller, silver dollar pancakes, so that you can try lots of different topping combos before you stuff yourself. 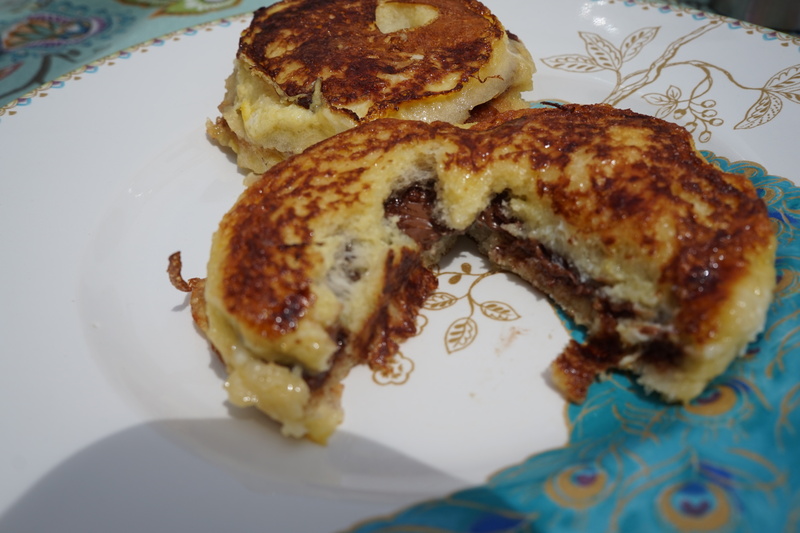 Perfect for a father’s day brunch – doesn’t dad deserve a nutella, chocolate chip, rum banana and syrup pancake??? I made some boozey strawberries which was just chopped strawberries (probably about a pint but this doesn’t need to be exact) macerated with 2 tablespoons of sugar and 3 tablespoons of cassis. I also sauteed some bananas, these were by far the most popular topping on the bar. Melt 2 tablespoons of butter of medium high heat in a skillet. Toss in 4 chopped bananas with 2 tablespoons brown sugar and 3 tablespoons of rum. Cook for about 5 minutes. Lastly I made a cinnamon compound butter which basically means mixing room temp butter with cinnamon and sea salt – add as much cinnamon as you would like. Each of these took almost no time at all but really elevated the selection. out anything you like – candied pecans, Nutella, mini chocolate chips, homemade whipped cream, and maple syrup. Of course I also made up a huge batch of bacon (do this in the oven and make life much easier) to go along. Since this is a self serve bar I thought using a chalkboard runner would be really fun. You can mark down what everything is and people can go to town themselves. Sur La Table has this one online but I have also seen them at Salt and Sundry in DC. If you don’t have a chalkboard runner I have these reusable place card holders that would be perfect. Either way make sure to have a good variety of toppings – salty, sweet, fruity and chocolatey. I set up my griddle (the other side of my raclette maker) and used…wait for this…a boxed mix for the pancakes. Yes it’s ok! Honestly these pancakes are way more about the toppings than anything else and I like the mix from Trader Joe’s. Hosting in the morning is hard enough – this is a great way to shorten your to do list and no one will notice. I made them pretty small so that folks could have a bunch of little ones with different toppings. Get some friends involved making the pancakes and you have to do very little work! A brunch this good demands cocktails so we went classic with a bloody mary bar. I HATE bloody marys, I actually wouldn’t even serve them when I was a bartender, but Patrick likes them and apparently makes a mean one so I let him take charge there. He likes to have a variety of hot sauces and toppings like olives, banana peppers and celery to add. We used chipolte vodka (also great in this drink) and DC’s own Gordy’s Bloody Mary Mix. For those of us who don’t partake in bloody marys I opened some bubbly and set out liquors to mix in like cassis and St. Germain. We also served coffee with Kahlua to mix in if you like your cocktail with your caffeine fix. I usually like to send people home with something from a party and this time was no different. Since all of our friends we hosted have doggies at home I made homemade dog biscuits and put them in cute little bags from them to take home (I am sure Gabby and Hagen would have preferred leftover bacon but there was definitely none left!). I used this recipe by Ina and some cute dog bone cookie cutters. The bar was a great success with guests of all ages. Baby Hazel made quick work of these pancakes, though she is going to have to wait a couple more years for a bloody mary! So happy father’s day to all the dads out there including my own – may your day be filled with love and rum bananas! February 23rd is National Banana Bread Day but really, shouldn’t every day be banana bread day? Kids and adults alike love it, it’s super easy to make and is basically dessert for breakfast! The women of my family, when they see 3 bananas sitting on the counter that are a little less than perfect, all think the exact same thing – time to make Nanny’s banana bread!! Brown and smushy bananas – time for bread! Even if you don’t have occasion to eat the bread right away (though really why wouldn’t you?) bake it, wrap it in tin foil, and stick it in your freezer. You will be so glad to pull it out when you have impromptu house guests or you are stuck inside during a snow storm. Probably goes without saying but this banana bread goes perfectly with my Nanny’s amazing Hot Cocoa. Normally I encourage you all to experiment away, but with this recipe I humbly suggest you make it just as written (especially make sure to include the tablespoon of cold water). It can be hard to share beloved family recipes because so many emotions and memories are attached. However, sharing food is an expression of love and I like the idea that the love my grandmother gave to her family can be replicated in yours. So let’s make a deal – if you decide to throw in chocolate chips or blueberries or something just don’t tell me! Preheat the oven to 375 degrees and grease a loaf pan (I like to use the wrapper from the butter but cooking spray works too). Mix the sugar, butter, eggs and bananas together in a medium bowl with an electric mixer. Combine the flour, baking soda, baking powder and salt in a separate small bowl. Add the dry ingredients to the wet ingredients and combine, then add 1 tablespoon of cold water. Mix until the water and all the ingredients are incorporated. Pour batter into pan and bake for 1 hour. Preheat the oven to 375 degrees and grease a loaf pan (I like to use the wrapper from the butter but cooking spray works too). Mix the sugar, butter, eggs and bananas together in a medium bowl with an electric mixer. Combine the flour, baking soda, baking powder and salt in a separate small bowl. Add the dry ingredients to the wet ingredients and combine, then add 1 tablespoon of cold water. Mix until the water and all the ingredients are incorporated. Pour batter into pan and bake for 1 hour. If you live on the East Coast you are probably also dealing with the first blizzard of the year. DC has, well lets say “issues” dealing with snow. I have lived here for over a decade and I am still surprised by how paralyzed the most powerful city in the world becomes with just a few flakes of snow. As a Bostonian it took me a while to adjust but I have learned not to fight it and pretend that we are better at this than we are. 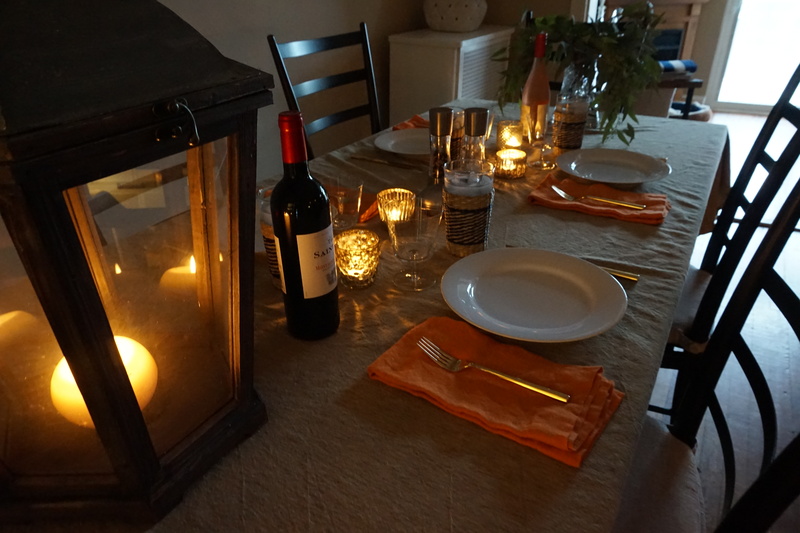 The smart thing to do is hunker down, have plenty of food and wine on hand and ride it out. One of the best ways to do that is with a nice mug of my Nanny’s hot cocoa – especially post shoveling. I like to buy some cans of evaporated milk right at the start of winter so I have it on hand, it’s perfect for a storm like this when you want to ration fresh milk. One of my earliest memories is making this cocoa with my Nana. When you mix the cocoa and sugar together it creates almost a little cocoa facial and the smell always brings me right back to being with her. Hopefully we can get out of here soon but in the meantime I am going to sip this cocoa and binge on Homeland. Stay safe and warm! Another option to stay warm! In a large saucepan whisk the sugar and cocoa together until completely combined. Shake up the evaporated milk and whisk in. Use the empty cans to add 2 cans of water. Whisk until the sugar has dissolved and all the ingredients are combined. Heat over medium high until hot to your liking. Any leftover cocoa will last in the fridge for several days. In a large saucepan whisk the sugar and cocoa together until completely combined. Shake up the evaporated milk and whisk in. Use the empty cans to add 2 cans of water. Whisk until the sugar has dissolved and all the ingredients are combined. Heat over medium high until hot to your liking. Any leftover cocoa will last in the fridge for several days. Since this week is the Patriots bye week our Sunday is wide open. This doesn’t happen too often in the fall – the perfect excuse to throw an impromptu brunch party. 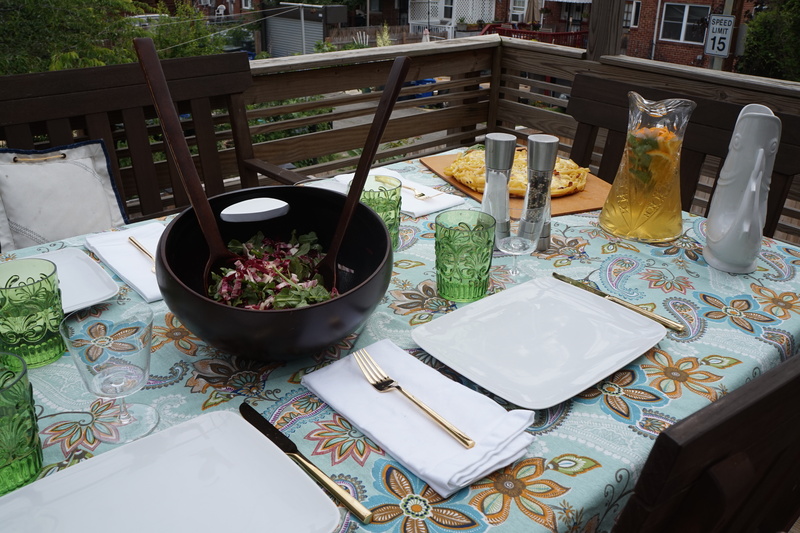 Having people over for brunch is one of my favorite ways to entertain. It’s pretty inexpensive, there is usually bubbly involved and people can go about their business later in the day. The key is to have some simple to throw together dishes, that only necessitate a quick run to the store. Actually you may just have all of this stuff in your pantry already. For me brunch is about having something salty and something sweet so you don’t have to decide between the two. Oh and bacon. Of course bacon. Add a bubbly drink on top and you will have some very happy friends. If it’s nice out doing brunch outdoors is really fun and adds to the festivity of it. Just because you are outdoors though doesn’t mean should always turn to paper plates and solo cups. I like to use real linens, footed glasses and sparkly flatware. 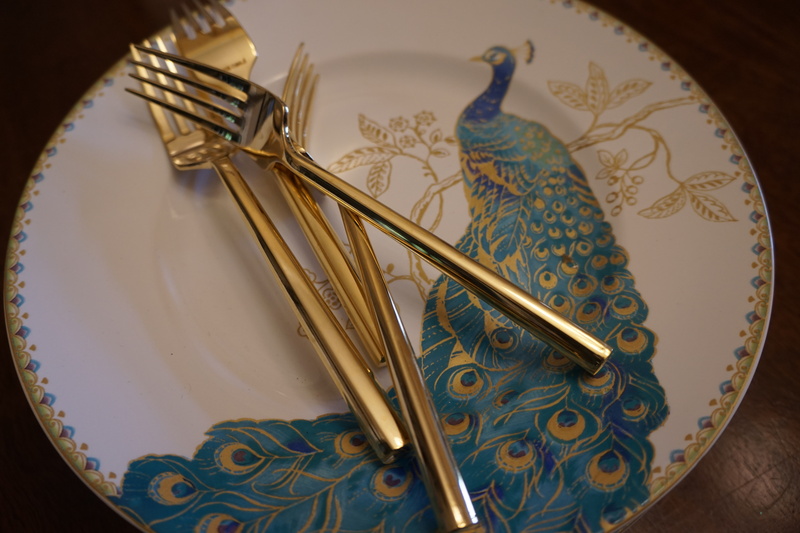 I found these amazing gold accented plates at Home Goods that go perfectly with my Izon flatware set from Target. When the menu is this easy it’s always nice to make extra effort with the presentation. This is the easiest pitcher drink you will ever make. 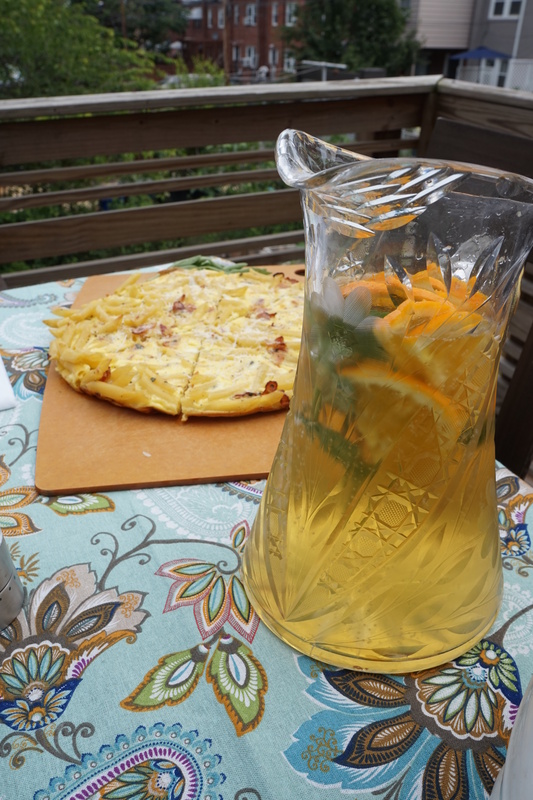 Slice an orange and drop it into a pitcher with some ice. Top with a whole bottle of Aperol and a whole bottle of bubbly (go ahead and make it with prosecco or cava to save some money). 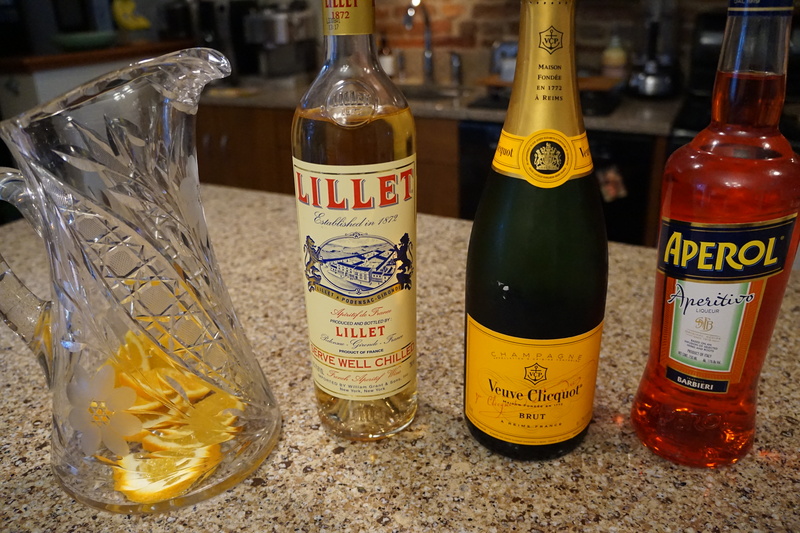 I like to add about a cup of Lillet Blanc as well, but it’s not necessary. Done! This drink is sparkly, citrusy and a little bitter – perfect for cutting through rich food like the frittata and low alcohol enough that you can still run errands after brunch. This frittata is delicious and has all the elements of pasta carbonara. It is pretty rich (pasta, cream, bacon, eggs…) but the recipe also has a delightful side salad made with bitter greens. The radicchio and arugula salad tossed with the lemony vinaigrette are the perfect foil to the frittata and side of bacon. Everything in this menu is about balance and this is the perfect centerpiece. Prep all the salad ingredients and cook off the pasta before hand so you only have about 10 minutes of actual cooking to do. Baking bacon is so much easier than cooking it in a pan. You don’t have to doge grease splatters and the bacon comes out nice and crispy and flat. There was bacon in the frittata but who ever accused a brunch of too much bacon?? 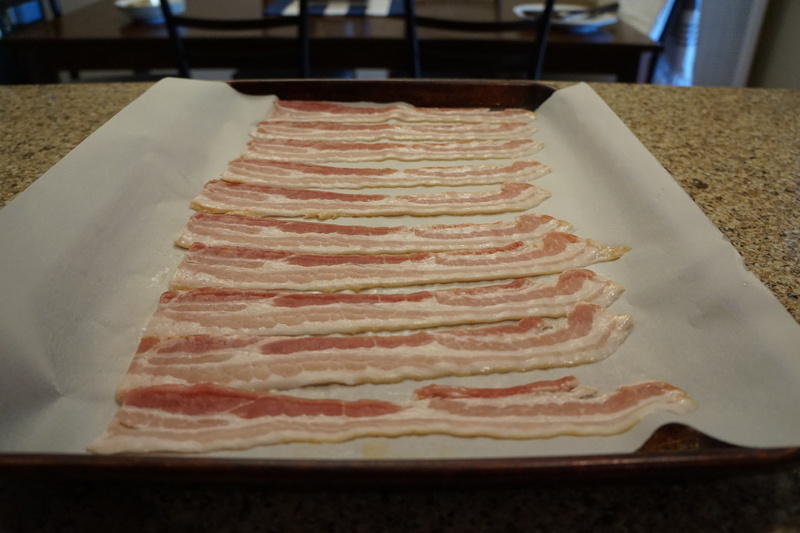 Place the bacon on a cookie sheet lined with parchment paper and cook at 400 degrees for 15 to 18 minutes. This way you can make trays and trays of bacon at one time if you are doing brunch for a crowd. If you want to bake this off at the same time as the frittata all the better – go ahead and crank the temperature to 425 as indicated for the frittata, and just start checking on the bacon at the 10 minute mark to make sure you don’t burn it. This post has to be the one I get the most positive feedback on. These mini french toasts stuffed with nutella are perfect for this easy brunch. I made them as a psuedo dessert but you could certainly serve them alongside with the frittata. Good news is they only take a couple of minutes to make so if you do make them at the end you only have to slip away for a few moments. When you come back with these babies your friends will be smitten! Happy national waffle day! I saw this being promoted at Whole Foods last week and wanted to do a post on it. Oh course I then realized that I make my waffles from a box so not exactly thrilling, artisan stuff. Then all of a sudden a dinner party menu popped into my head. Use the waffles as dessert and build a whole menu around breakfast foods. When I was in college the cook at my sorority house would do breakfast for dinner once a month and it was always the most popular night. It makes you feel like a kid to eat a stack of waffles for dinner and even better if you can pair it with a mimosa! For breakfasts and brunches I always try to get a good balance of salty and sweet. This menu brings all of that and appropriate sophistication so your friends don’t think you sold scrambled eggs as a dinner party. For the decor I tried to keep it somewhat rustic and simple since breakfast isn’t really the time for fussiness. I wanted an appetizer to start the meal that was classic breakfast with a twist. I spread room temperature marscapone cheese on plain bagel chips and sprinkled with sea salt and everything bagel spice. 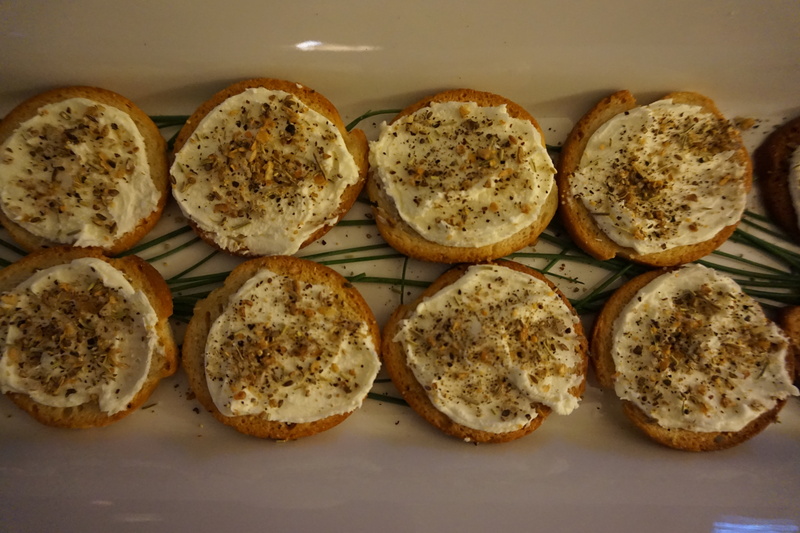 You could definitely use cream cheese but I had marscapone on hand and I think it added a richer sophistication to the canape. I have the Better Than Everything Bagel Seasoning Blend which is great but you could also make you own using poppy seeds, sesame seeds, crushed pepper, and onion and garlic flakes. I served these with champagne to start the meal. 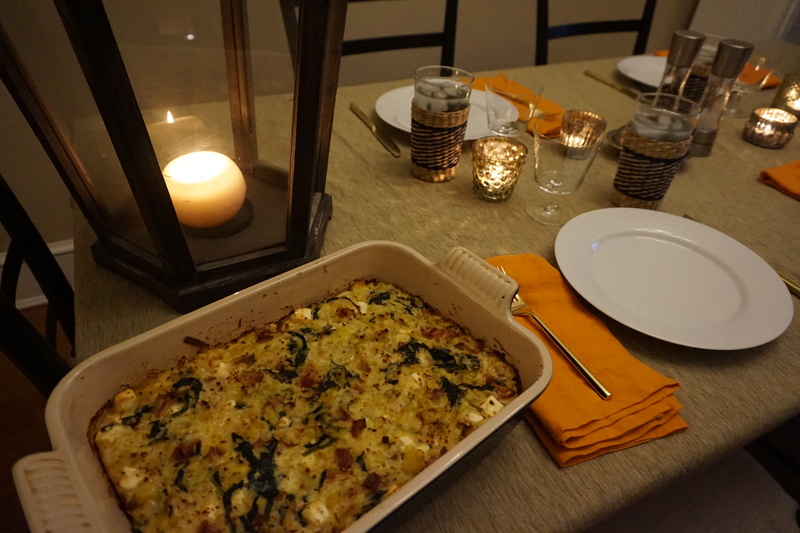 This dish is the reason why I was able to do this dinner party on a weeknight. Instead of making eggs, frying up bacon and then trying to get a salad or veggie in there somewhere I threw them all into a casserole. This delicious recipe from Food and Wine magazine was a hit and the left overs were terrific the next day. It’s a lot like a frittata but even easier because you don’t have to worry about flipping it. The addition of greek yogurt I thought odd at first but it really gives the dish a nice tang and helps bind the whole thing together. 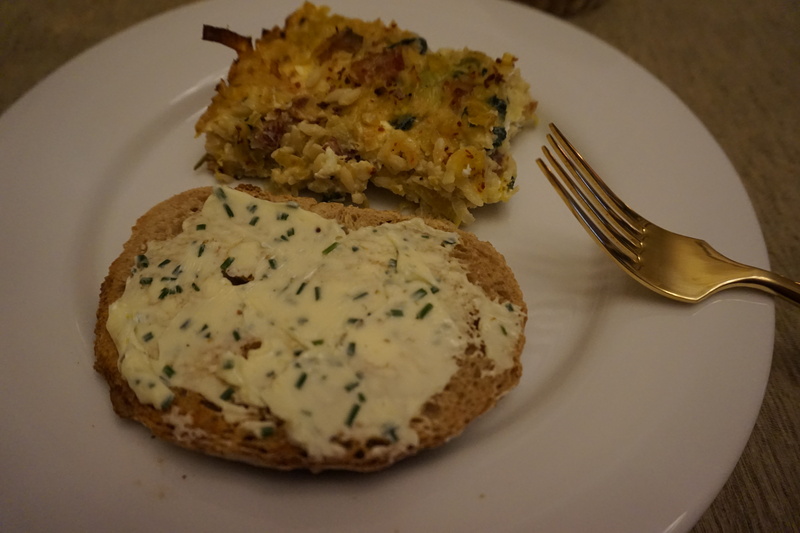 I also toasted up some sourdough bread that I had in the freezer and whipped up a quick herb butter to serve along side of it. Just mash up room temperature butter with any herbs of your choosing, I went with chives here and some sea salt. I have tried making waffles from scratch and cannot tell the difference at all from those that came from a box. I like Trader Joe’s Buttermilk Pancake Mix but I honestly think any box mix will do. To class these up I substituted Kahlua for half of the water that the mix calls for. You can make the batter in advance and just keep it in the fridge until you are ready to make the waffles. 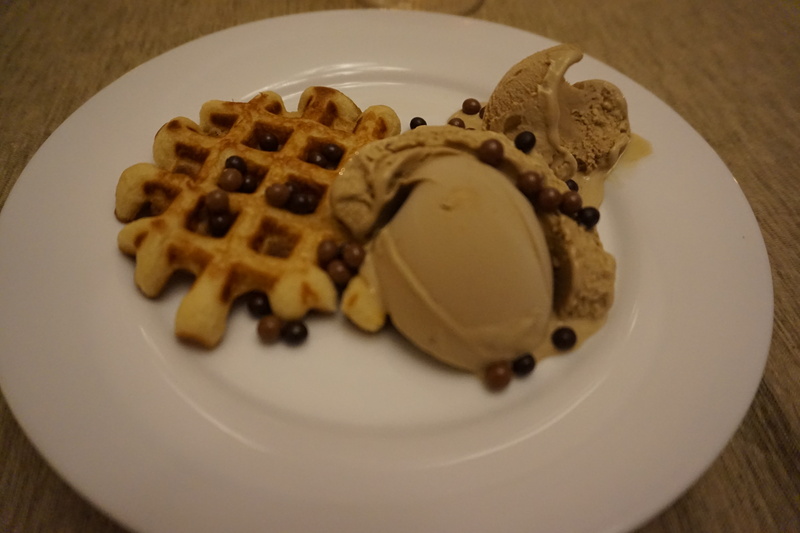 I topped it with coffee gelato, sticking with the breakfast theme, and some dark and milk chocolate balls for texture. It was a delicious and fun evening with zero stress. Best of all any leftovers can be eaten the next morning for breakfast of course!